Bourges, a town of France, capital of the department of Cher, and formerly of the province of Berry, at the confluence of the Auron and Yevre, 60 m. S. S. E. of Orleans; pop. in 1866, 30,119. Most of the old ramparts have been converted into promenades. The town has numerous interesting old houses and public buildings. The cathedral of St. Etienne is one of the most celebrated in France, and in the church of St. Pierre is the tomb of Jeanne la Bienheureuse, consort of Louis XII. The hotel de ville, originally the private mansion of Jacques Cceur, is an interesting building. The university of Bourges, founded in 1463, acquired great celebrity by the teachings of Al-ciati, Cujas, Calvin, and Theodore Beza. It has since been converted into a lyceum. Charles VII., from his temporary residence here, was called king of Bourges. Bourges is the see of an archbishop, and has excellent institutions of education and art. It is renowned for its school of artillery and extensive military workshops, and is one of the great arsenals of France. It has an iron foundery, saltpetre works, and cloth manufactories. The chief trade is in sheep, wool, cloth, hats, cutlery, hosiery, porcelain, wine, and confectionery. The town is remarkable for its jewellers' and silversmiths' shops. It is the birthplace of Bourdaloue. It occupies the site of Avaricum, the ancient and flourishing capital of the Bi-turiges Cubi, which was captured by Caesar in 52 B. C, when almost all its defenders and inhabitants were slaughtered. It was subsequently the metropolis of Aquitania, under the name of Bituriges. 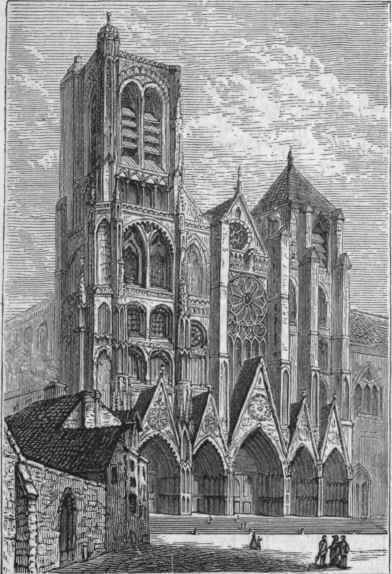 Destroyed by Chilperic I., it was restored by Charlemagne and enlarged by Philip Augustus. During the middle ages many councils were held here. The pragmatic sanction of Bourges, established under Charles VII. in 1438, declared the pope subordinate to a general council.